Complete Cheetah Cub Cylinder kit. 421cc 68mm bore with 4mm stroker crankshaft. 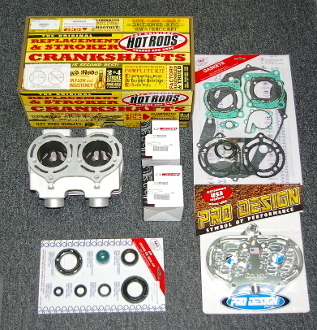 Kit contains 421cc Cub cylinder, hardware kit, 2, 68mm long rod piston kits, Hot Rods 4mm stroker crankshaft, TDR billet cylinder head or Pro Design Cool Head, complete gasket kit, complete seal kit. Everything needed to assemble. A few options are listed but there are lots of other options that are Not listed. Foe a custom engine package please call us. If you have checked an option & this message comes up. please put a quantity ( 1 ) in the square below the description.